You can visit six continents and 31 countries aboard this ship in an around-the-world cruise in 2017. In 2017 you'll have a chance to cruise around the world. But living the dream doesn't come cheap. 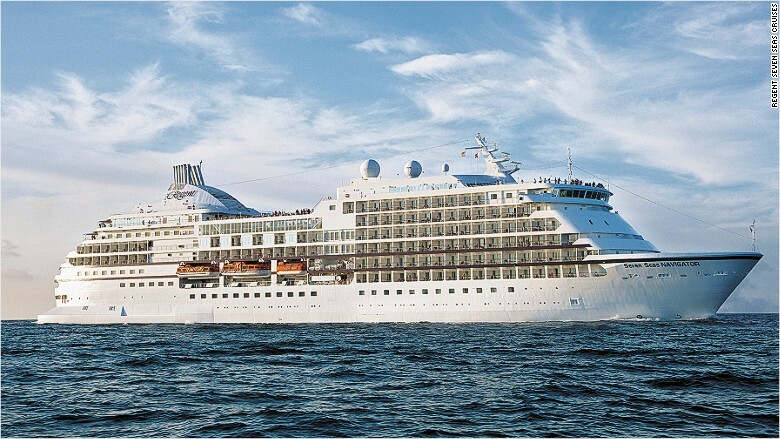 Regent Seven Seas Cruises is offering a 128-night around-the-world voyage on the Seven Seas Navigator. The ship will leave from Miami on Jan. 5, 2017 and will visit six continents, 31 countries and will dock at at least 60 ports of call. Travelers can book the cruise starting Wednesday with fares starting at $54,999. All fares include meals, shore excursions and first-class air fare. Passengers can upgrade to packages that offer more in-depth tours in certain cities. "The demand has been really good," said Jason Montague, president and COO of Regent Seven Seas Cruises. "We had interest that was close to 50% occupancy before we opened, we are expecting today to be major." Travelers who want to upgrade to the largest room on the ship, which is more than 1,000 square feet and comes with butler service, will pay $159,999 per person. The trip's first stop is in the Caribbean and is followed by visits in Central America, Hawaii, New Zealand, and parts of Australia. In Asia, passengers will explore Thailand, India and the United Arab Emirates among other countries. European stops include Italy, France, Spain, Greece and Gibraltar. The Seven Seas Navigator holds 490 guests with a staff to passenger ratio of 1 to 1.4. All the rooms on board are suites, according Montague, and 90% come with a balcony. Regent is set to add a new ship to its fleet next summer, and Montague said the expansion allows it to offer the world cruise in 2017, the first time since 2011.